This week I have been pondering the possibilities inherent in the relationships around the preaching triangle. God and preacher, preacher and listener, listener and God. I have certainly found it a stir in my own heart. But as always, our view of God is profoundly significant here. What kind of a God instigates this powerful circuit of relational connections? Surely only a clearly Trinitarian God makes any sense here? 1. It takes the kind of God who exists in mutual delight to create the people, to birth the church, to shape the ministry in such a relationally delightful way. 2. It takes the kind of God who delights to communicate in a self-giving and other-centred way to make sense of the rich benefit for the preacher in their personal connection with God, or to make sense of the preacher giving themselves away in a non-self-protective nor self-serving ministry to listeners, or to result in an other-ward goodness-spilling dynamic among listeners. 3. It takes the kind of God who knows how to communicate effectively to make the Bible such a wonderful and vital book in each of the preaching relationships – a book that speaks engagingly to the heart of the preacher with every increasing profundity, a book that offers such rich variety and engaging diversity to allow a preaching ministry to not grow stale, a book that can be read with delight and benefit by the least trained new believer. 4. It takes the kind of God who knows the richness of community to leave us with a ministry model that creates communities on every side – communities of care, communities of responsiveness, communities of delight and service. 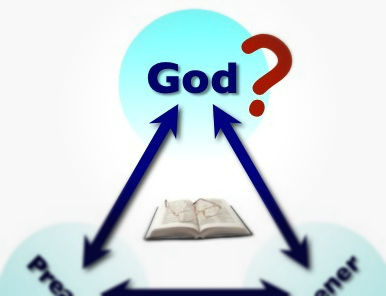 Other Christian versions of God simply don’t make sense of the Preaching Triangle. If God were not genuinely Trinitarian, the preaching triangle would surely look different. Tomorrow I’ll ponder a couple of possible alternatives. Hi Peter, I have been greatly enjoying this Triangle series and was just considering how our other-ward goodness-spilling God longs to spill over into the lives of those who do not yet know this dynamic relational God and does so through His communities of other-ward goodness-spilling Spirit filled people. What kind of a God instigates this powerful circuit of relationships? A relational, Trinitarian God, Who knows that apart from us having a relationship with Him, we can do nothing.